· Theatre began thousands of years ago, probably before the start of recorded history. · Early cultures used ritual, dance and storytelling to communicate. · A RITUAL is an action performed REPEATEDLY because of its symbolic significance and its ability to evoke the emotions of those engaged in the performance. · Common to all traditional cultures, the shaman is a priestly figure who communicates directly with the gods through rituals for the benefit of the community. · Rituals were usually performed by elders, priests or shamans. · Our knowledge of early theatre and rituals comes from wall painings, artifacts, and hieroglyphics. · Rituals often told a story based on the culture’s beliefs. These stories were often based on MYTH. · Myths gained a life beyond the rituals, and began to be performed for entertainment. · Myth, Stories, Rituals BECAME Habit, Tradition BECAME Entertainment which BECAME Theatre! · The earliest example of ritual evolving into theatre comes from Ancient Egypt. The world’s first report of a dramatic production is an Egyptian drama known as the Abydos Passion Play. - The play at Abydos is the story of the god Osiris. the very beginning of spoken language. · Homer was a blind poet who may have been born on an island in the Aegean Sea (GREEK). · He probably composed his works between 700 and 800 B.C. author of the epic poems, the Iliad and the Odyssey. · Homer was one of the first storytellers to use repetition and dialogue in his stories. · Homer’s (and others!) stories provided many of the ideas and plots for playwrights that came after him! · Dance is another probable origin of theatre. · Dance was often used as part of rituals. Theater I students are beginning work on a SUMMATIVE collaborative assignment: the Primitive Theater Project. Reminder: SUMMATIVE assignments make up 60% of your class grade! Don't be a slacker in your group! 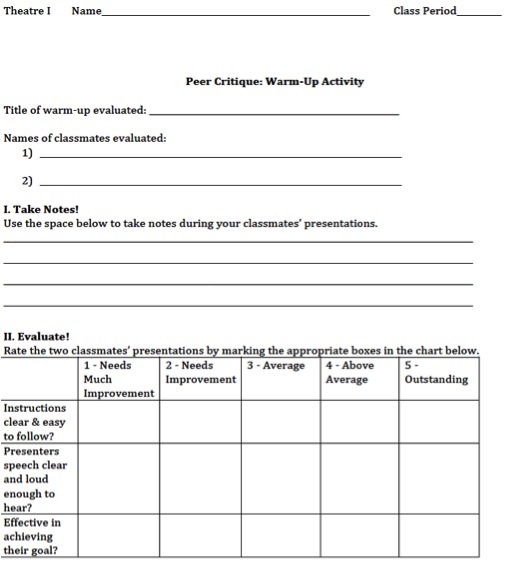 Objective: Students will reinforce the importance of warm-ups by creating and teaching a theater warm-up to the class. This activity also is a collaborative effort, teaching students that theater arts is a collaborative art form. 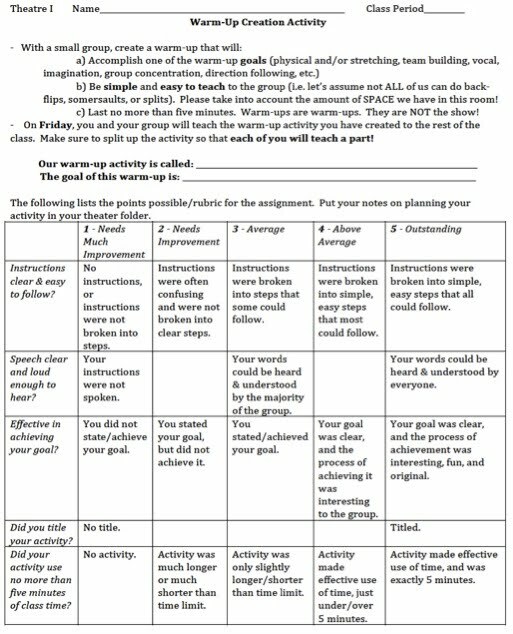 Assignment Details: Students create, plan, and teach a theater warm-up activity to the class. See images below for more details!